Having trouble with MEAP getting track names in Cubase 8 (or later versions)? Especially if it has been working fine in earlier Cubase versions? The symptoms of this could be that you notice the mouse move to the Inspector instead of to the track that is active. Or that you notice MEAP entering odd things instead of the track name. This is most likely because you have your Inspector open and the Solo button and background in the inspector looks very similar to the Solo button and background on a selected track. 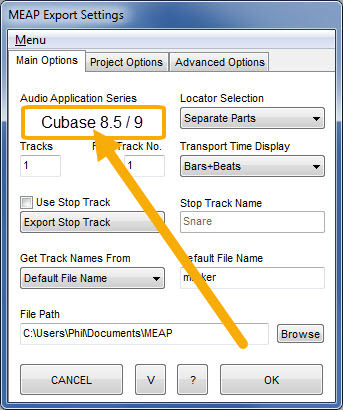 Simple solution – CLOSE THE INSPECTOR when exporting with MEAP using Cubase 8.x (and onwards). MEAP gets track names by finding the active Solo button on the selected track and moving the mouse over to get the actual track name. If MEAP sees something that looks like an active solo button on a selected track it will move to the first image is sees. 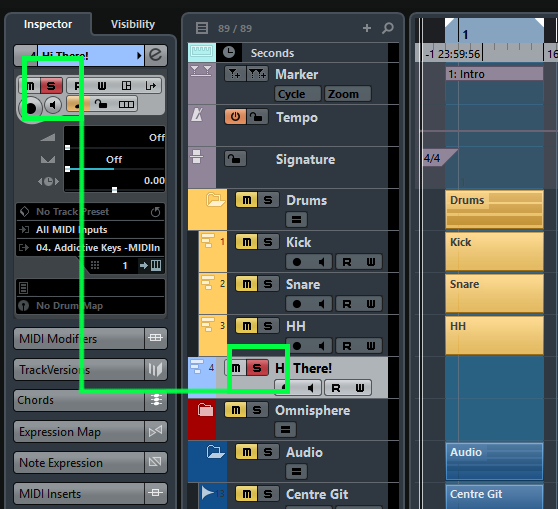 In Cubase 8 the background in the Inspector has become very similar to the background colour of a selected track. You can also – Read more about this in the manual. You can adjust the tolerance in the ini file or use your own graphics and set the tolerance value to 1. The reason it is happening is that a little while ago a new way of recognising the buttons was introduced which is really clever as it allows for a large amount of tolerance. the number 1 trouble users have had over the years with MEAP was that Graphics Not Found error because their screen was not set up exactly the same way as when the MEAP buttons were captured. MEAP has to scan the entire left side of the screen – on the first export only – to find that first selected Solo track. 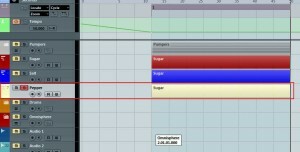 After that MEAP will only look around the previous track that was exported. But the problem is on the first export, it may find a Mute button even if not selected. This will only happen if the Skip Muted Tracks or Folder Tracks option is selected. In the latest version of MEAP the tolerance for the Skip Selected area is much higher so it will only find an almost exact match for a selected Mute Button. Of course the problem may now arise that your Selected Mute/Folder Button looks different from the original and will not be recognised at all. In which case we will nee to make custom graphics as mentioned above. 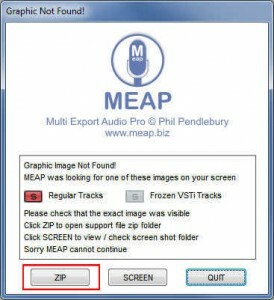 Many Cubase 6 and 7 users may not be aware that since Version 7.67.141 of MEAP – The Export Button is actually pressed by a Key Command. This was done in order to make sure MEAP does not have to scan your screen for the Export Button on every export, hence saving time. Some users miss how important setting up the Key Commands is. Everything MEAP does is controlled by a specific set of Key Commands that must be installed into your audio application. Make sure you save your existing Key Commands (and Macros) by going to Cubase Key Commands dialog and saving them. 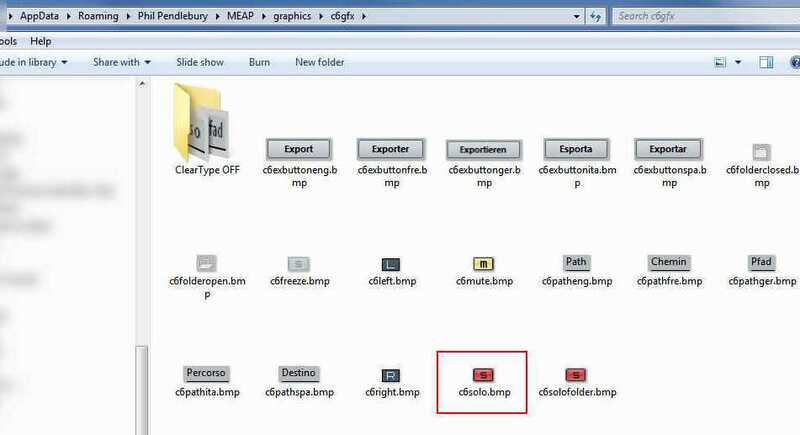 It is absolutely vital that you then select the MEAPKeysVx (where x is your audio application version) set of key Commands in the same area. Obviously if you have any MACRO keys set up – these may interfere with MEAP’s key commands so they should be removed temporarily (this is why we saved everything above). Once you have set up the MEAP Key Commands, do a small dummy export and see if it works. The new Key Command for Export Audio is Ctrl+SHIFT+K and it is included in the new MEAPKeys files. This will force MEAP to use your button graphic instead of the Key Command. 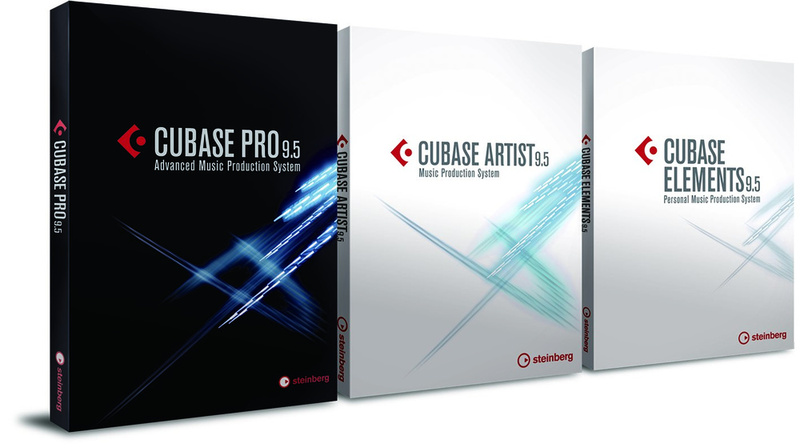 As of version 7.67.049 released on February 06 2013 – MEAP now supports Cubase 7. This version also adds a new image finding algorithm to drastically reduce (if not completely eliminate) Graphic Not Found Errors. MEAP is a Windows only application. MEAP will run on all known current versions of Windows 32 bit and 64 bit. 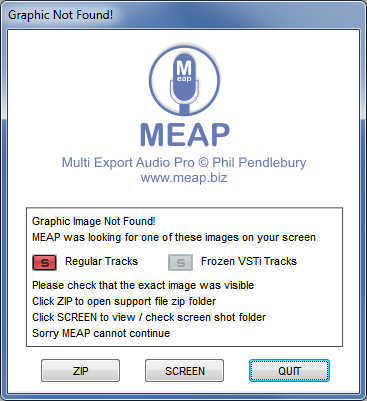 The most common problem that stops MEAP working is the Graphic Not Found Error. This happens when MEAP is looking for a particular graphic (for example the Solo button) and because the button may not appear the same on all systems, MEAP may not be able to find it. This is easy to fix. 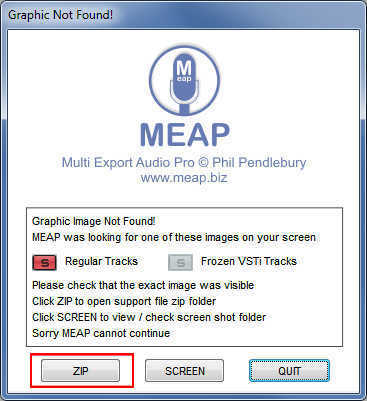 And as you probably know, if you send a message and Support Zip File to MEAP Support, you will usually receive a custom graphic specifically for your system within a few hours. However, if you are in a hurry or even just a little interested, you can do it yourself. MEAP has already tried to give us a clue which graphic it could not find, in the error message. Graphic Not Found – Argggh! In this case it was the Solo button. It was lit up within Cubase but for some subtle (or sometimes obvious) reason, MEAP didn’t recognise it. 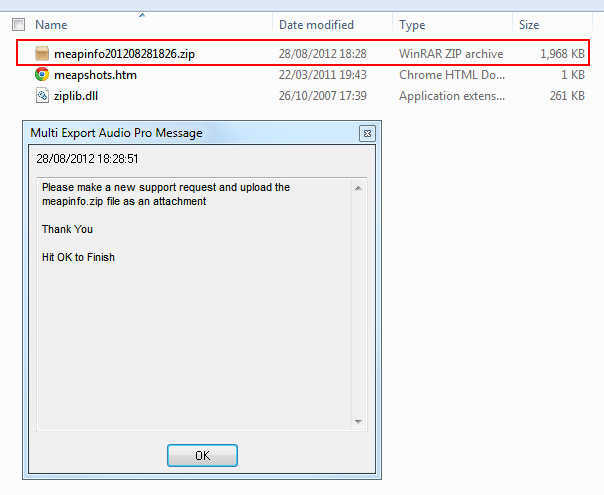 You can access the ZIP file that MEAP has created directly from this message by clicking the ZIP button. 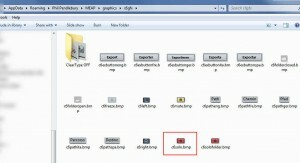 Open the Zip file and you will see a group of files. One of them should be named final.bmp (Note: If the final.bmp does not exist, simply use any screen shot that contains the graphic areas you need). If you look at this screen shot you should see the button or area that MEAP was looking for. To your eyes it may look OK but sometimes computers can be very picky. So now we are going to make our own version of the graphic – So it is exactly matched to your system and MEAP will always see it. First, make some copies of the final.bmp so that you can rename them correctly before editing. The new graphic must be a Bitmap and stay in the same format that MEAP used. Zoom in so that you can see how the original graphic was cropped. It is important that the graphic is cropped in the same way, especially for the Path graphics. Then we can start to crop down the new graphic and zoom in until they look similar. Finally you should end up with a graphic that looks almost identical to the original. But remember this has been made from your own screen shot so it will match your setup exactly. Now – Save the file. 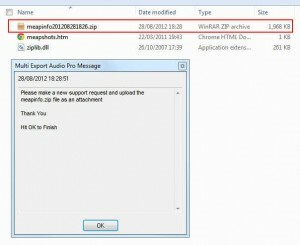 Do not change the file type or make any adjustments to colour or contrast, brightness etc. This is why we renamed the final.bmp to the button name before we started editing. So you can simply save the new file. You now have a set of graphics that are totally matched to your current system. Keep them safe! If you ever re-install MEAP or install an update, you will need to copy these graphics over the originals again. Good luck and happy exporting.